Introducing our new program designed to both build your business and help increase our coverage of local sports. Window/Door Stickers for your Store or Vehicles. We will give you custom full color decals for your store, office or vehicles. A great way to show your customers that you support them and their kids. You will get a 3-line listing for your business, including your name, address, web site and phone number in a special listing in your school’s section. You pay one time and it runs every month for a year. Your ad will be seen in all of our on-line editions and well as the printed magazine. That includes the free version on our web site, on our facebook page and on Magzter.com smartphone application. You will get sponsorship of one facebook.com photo gallery during the year. A typical gallery will get 200,000 photo views and will be linked over and over on other pages. Your name will be in each caption and as a slide in the gallery. Included is a 300x200 web banner on your school’s page on VarsityMonthly.com. Not only will thousands of customers see your banner, but being linked to a high traffic site is a great way to build your search engine rankings. If your team wins an MHSAA Regional or higher we will run a full-page congratulations ad for that team and school. You will be included on that ad for no additional charge. You will qualify for our best 12-time contract rate for any display ad you buy during your year. 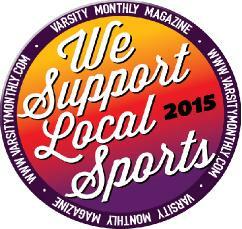 Join Varsity Monthly in Supporting Local Sports All Around the Area!